Ensuring your employees’ and fleet are safe on the road is pertinent for several reasons. If there are unsafe practices in your business you will have higher costs, employees are less productive, and it will be harder to retain employees and contractors. There is also your reputation to consider. And at worst, there could be a crash resulting in death. 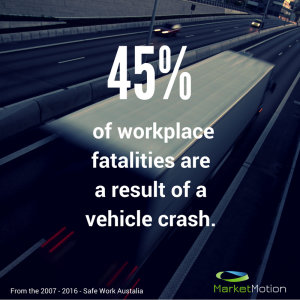 If unsafe practices lead to a vehicle crash, it can be extremely costly to a business. The Federal Government estimates the average cost of a hospitalised injury resulting from a crash is $214k and the average cost of a fatal crash is $2.4M. There is an impact on the reputation of a business with unsafe practices. Tip Top has received very bad press recently for their alleged treatment of owner drivers. ALDI has been accused of encouraging poor work practices that have allegedly left truck drivers reeling, forcing them into “long and dangerous hours” according to the Transport Workers Union (TWU). There is a further social and emotional impact on families, colleagues and the community of those involved in crashes that you cannot put a dollar figure on. A fatality is simply devastating to families, colleagues and the community. A business deemed to have unsafe practices can lead to a higher staff turnover and a drop in productivity. This will have an impact on cost to the business. So, businesses need to take steps to attract and retain drivers. A great way to do this is by ensuring safety is a priority and to have a good safety record. Australia also has an ageing population. The average age of a truck driver in Australia is 47 years. As the workforce continues to age along with the forecast of increased freight volumes there will be a strain on driver availability. This will lead to increased competition for drivers, so businesses will need to do everything they can to retain and attract drivers. Recently, Market Motion broadcast a webinar on tips for safer route management. You can listen to the recording today. Call us on 1300 558 381 if you want to know how you can improve your safety practices.